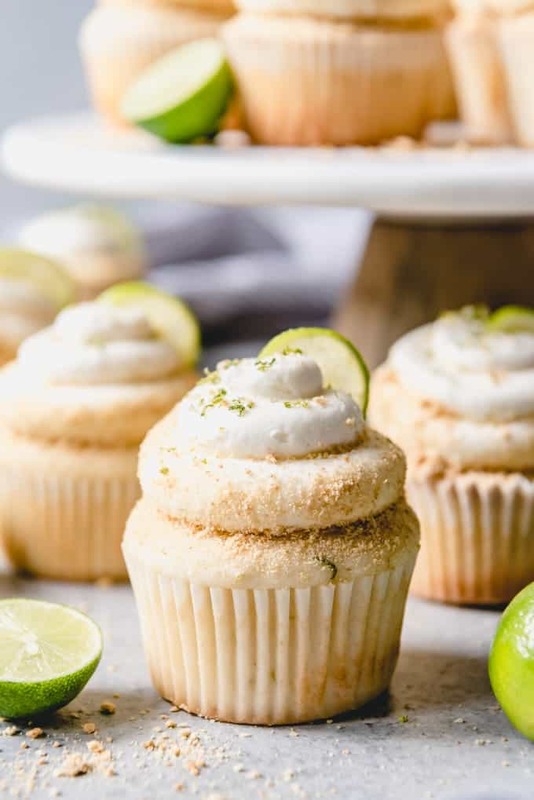 Take a tropical vacation with these delicious and moist Key Lime Cupcakes topped with a key lime buttercream frosting and graham cracker crumbs! Key limes and I have been having a moment lately. 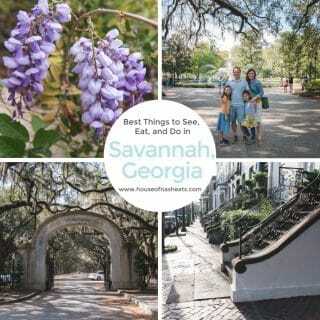 It started with baking up a classic key lime pie recipe when I was exploring the foods that Florida is well-known for as part of my American Eats series. But I just couldn’t get enough of their tart and tangy deliciousness. 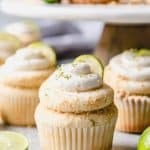 So I decided to bake key lime cupcakes instead for Spring Sweets Week with some of the key limes that Melissa’s Produce sent me. 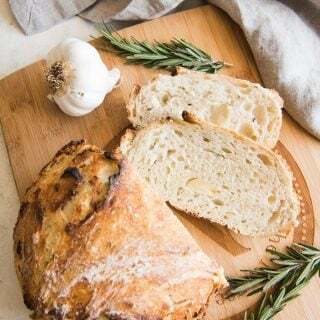 Enter our giveaway below for a chance to win a box of goodies from Melissa’s Produce or one of 7 other fabulous prizes! These cupcakes were supremely delicious! 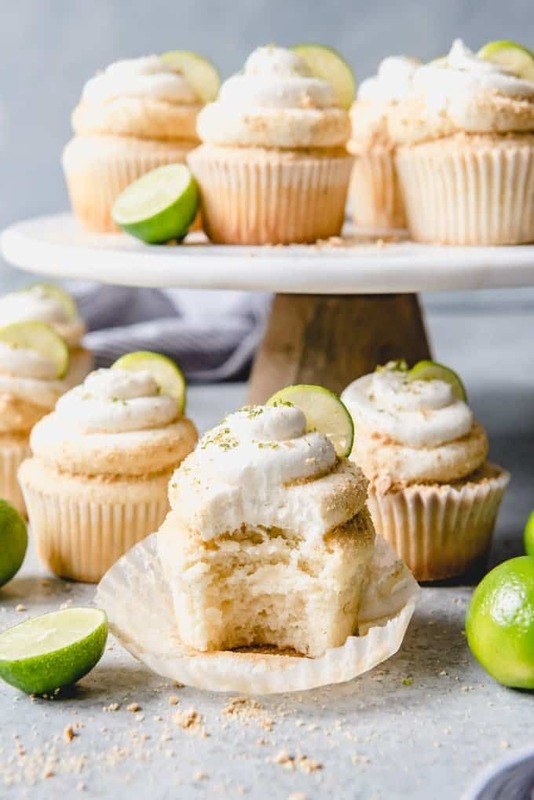 The cake part is essentially a wonderful vanilla cupcake that gets a key lime makeover with juice and zest from key limes. Then the frosting gets the same treatment before being piped on and rolling the edges in crushed graham cracker crumbs for the complete key lime pie effect just in cupcake form. 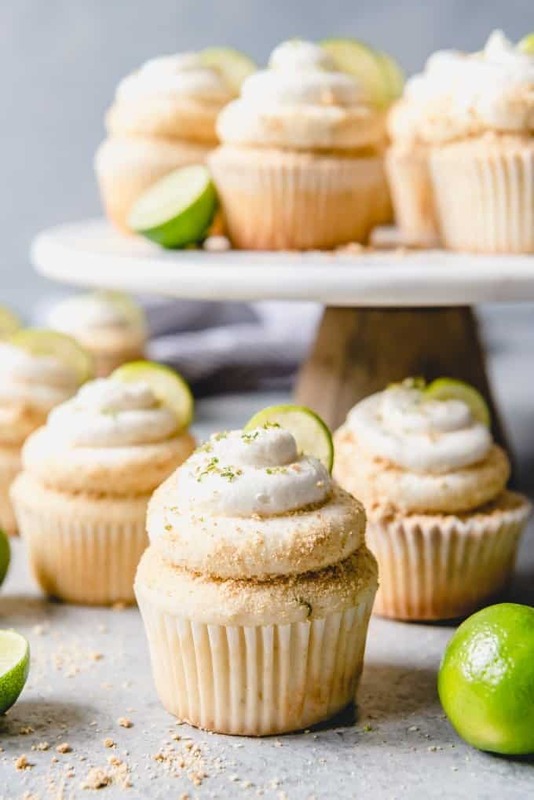 But full disclosure: I feel like I missed an opportunity to fill these with key lime curd and top them with the graham cracker frosting from my s’mores cupcakes instead. 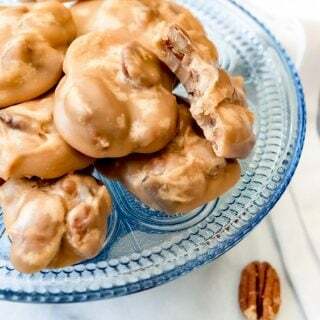 Don’t let that stop you from making them, because they are scrumptious as is, but I do wish I had thought to try it at the time. Truthfully, I’ve never made “filled” cupcakes. And it just didn’t even cross my mind until these were all finished. 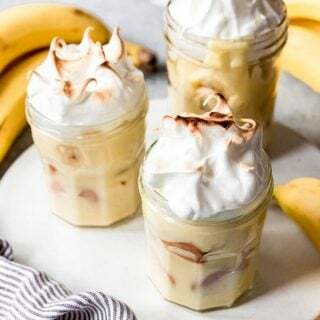 But I will definitely be making these again and going for the lime curd and graham cracker frosting variation next time. I will report back and let you know how they turn out. 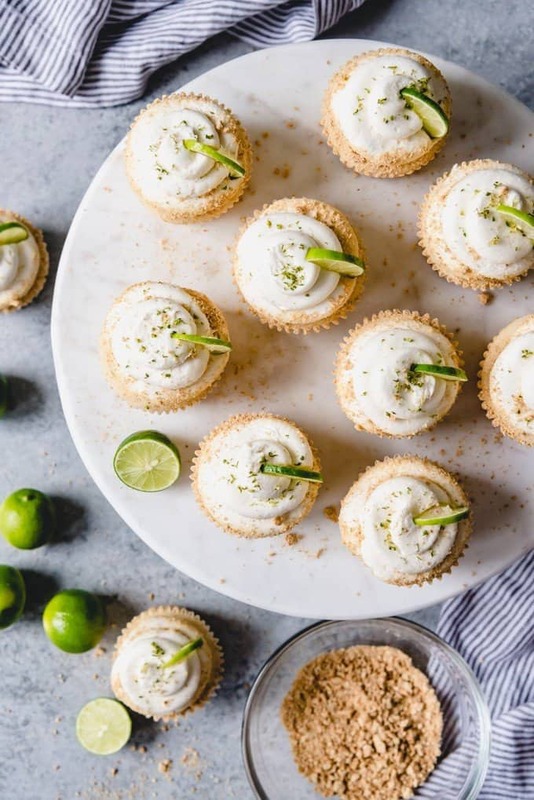 If key limes aren’t in season, you can substitute an equal amount of regular lime juice and zest in the recipe. 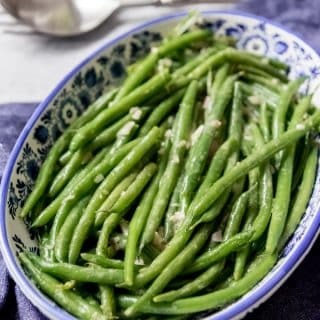 The flavors are subtly different – key limes are more acidic and have a slight floral aroma to them – but they are close enough to make this recipe work. If you have never used key limes before, they are tiny! I have found that it takes 3, 4, or even 5 times the number of key limes to get the same amount of juice or zest as regular Persian limes. But it’s worth it! 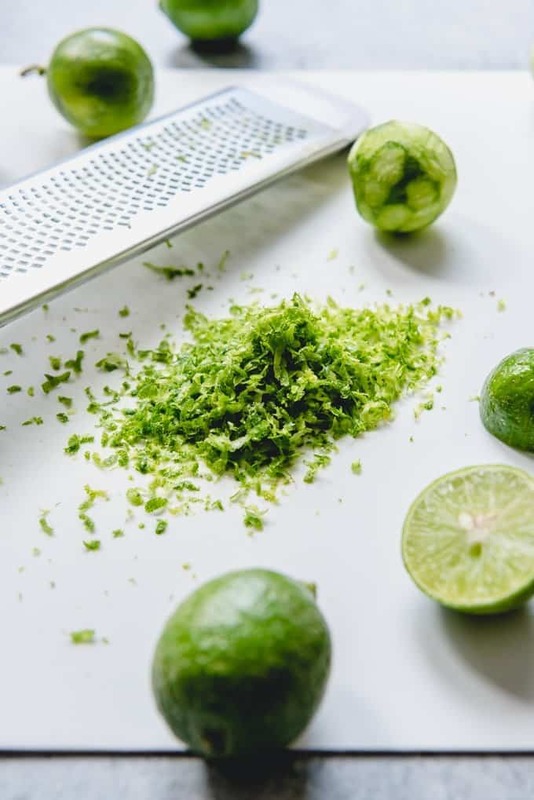 You might find it easier to use a garlic press to extract the juice from the limes than to juice them like you might oranges or lemons. Zest and and juice a whole bunch of key limes. Make sure to zest first, then juice, because it will be impossible to zest the key limes after you juice them. Cream the butter and sugar together in a large bowl. Don’t rush this step as it should take about 3-4 minutes. I find it easiest to use a stand mixer but you can use a hand mixer just as well. 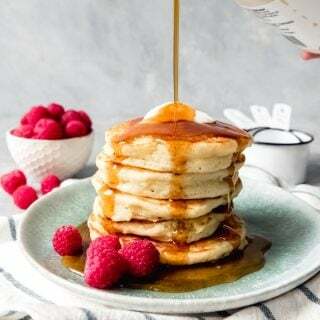 Mix in the sour cream, vanilla, and key lime zest, then add the egg whites, two at a time, scraping down the sides of the bowl so the batter gets evenly mixed. 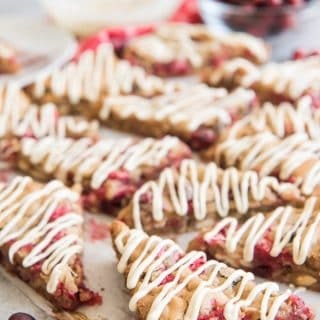 Whisk the flour, baking powder, and salt together in a separate bowl, then add those ingredients alternately with the milk and key lime juice, mixing and scraping between each addition until combined. 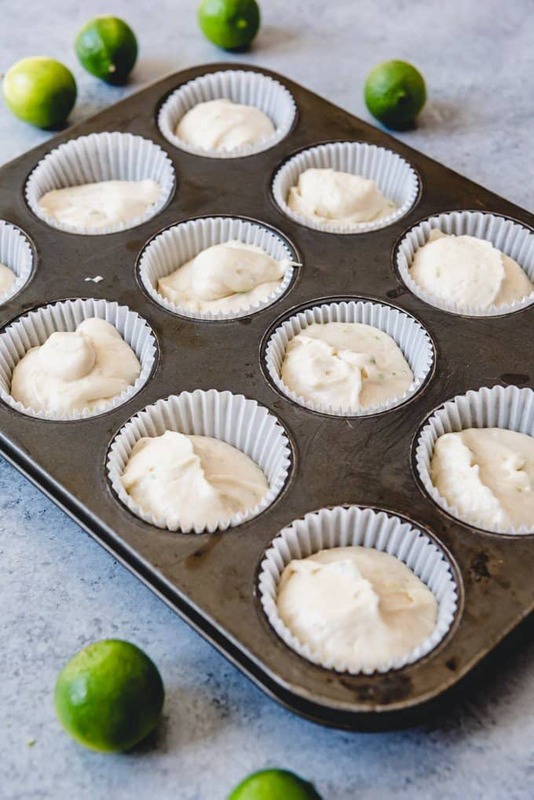 Fill cupcake liners in a cupcake pan about 3/4 full, then bake for 15-17 minutes in a 350 degree F oven until done in the middle. You can test with a toothpick, but with cupcakes I always just press a finger on the top of one cupcake. If it leaves an indentation, they aren’t done yet. If the cupcake springs right back, they are done. 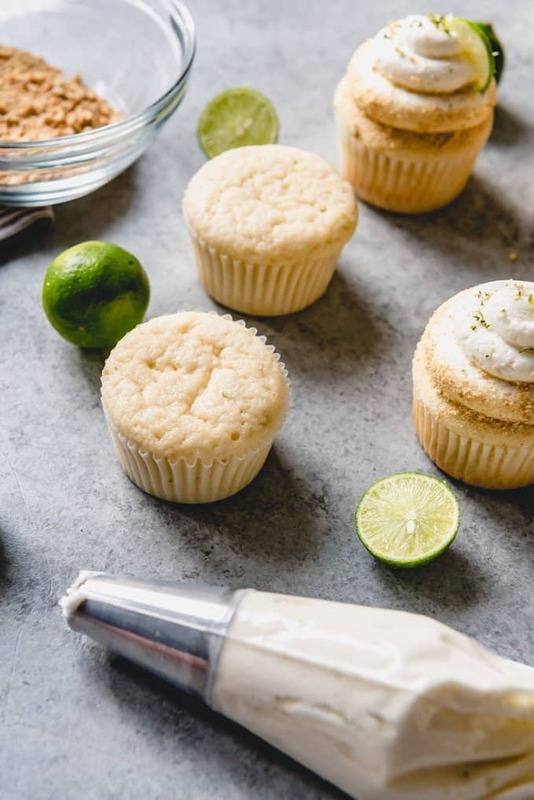 Cool the cupcakes completely before frosting. .
Make the frosting by first beating the butter using a mixer until smooth, then adding the powdered sugar in two batches, mixing on low speed until combined. 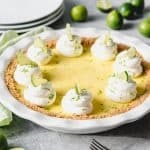 Add the key lime zest and 3 tablespoons of the key lime juice, mixing well and adding additional key lime juice as needed to reach a good piping consistency. Transfer the frosting to a piping bag with a decorative tip and pipe the frosting onto the cupcakes. 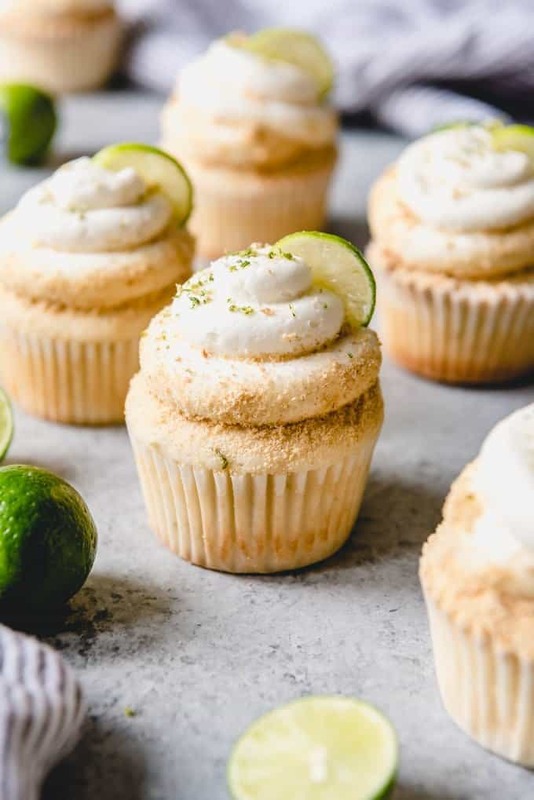 Finish by sprinkling graham cracker crumbs and additional key lime zest around each cupcake or over the top. Use room temperature ingredients. It really makes a difference to use room temperature eggs, butter, and sour cream. The cupcakes will be lighter because of it since the ingredients will be able to combine better when room temperature. If you have trouble getting juice out of your limes, try heating them up in the microwave for 10-20 seconds and rolling them on the counter before you slice and squeeze them. Also, be sure to use your limes while they are still fresh. Don’t fill your cupcake liners more than 3/4 full. These don’t dome quite as well on top as some of my other cupcake recipes, but they are still delicious and nobody will know once the frosting is on. 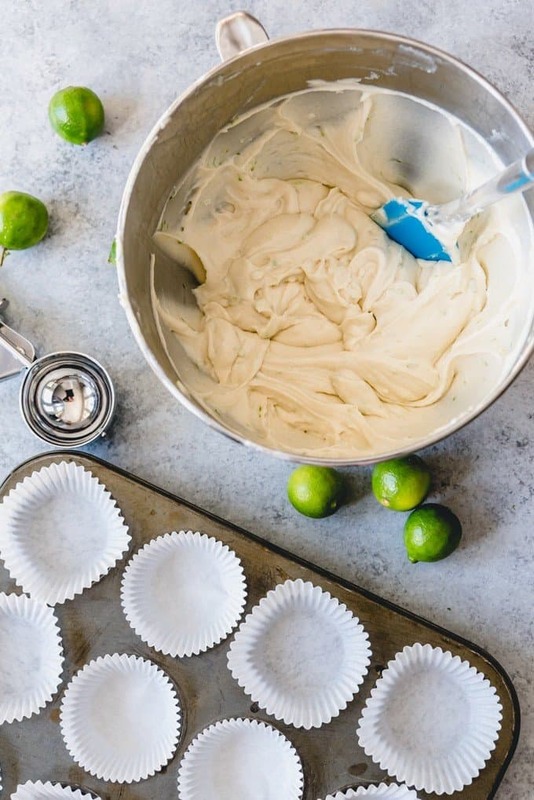 Use a large cookie scoop to evenly fill the cupcake pan. 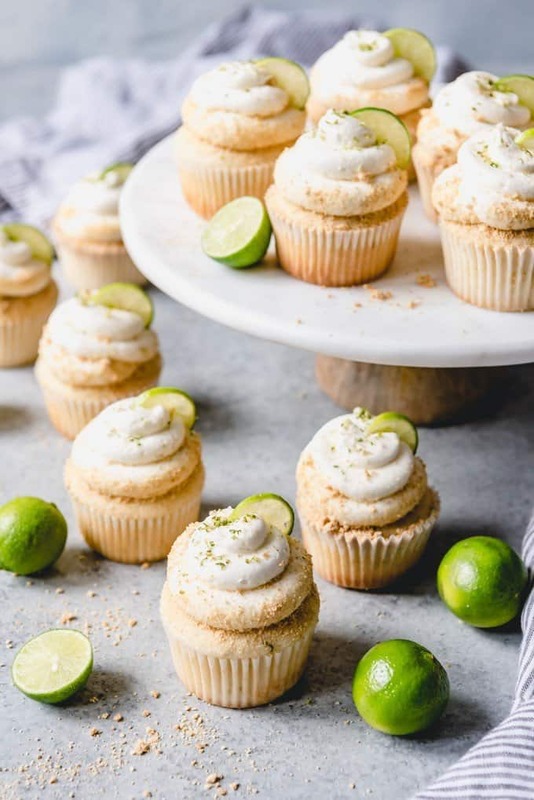 I like to decorate the tops of the cupcakes with thinly sliced half-circles of key limes. It’s not necessary, but super cute. Preheat the oven to 350 degrees F. Line a cupcake pan with 12 cupcake liners. 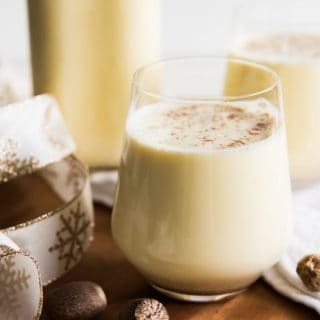 In a large bowl, cream together the butter and sugar until light and fluffy, about 3-4 minutes. Add sour cream, vanilla extract and and key lime zest and mix until combined. Mix in egg whites two at a time, mixing well after each addition and scraping down the sides of the bowl as needed. 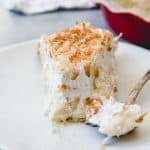 Whisk together the flour, baking powder and salt in a separate bowl, then add alternately with the milk and key lime juice, mixing between each addition until combined and scraping the sides of the bowl as needed. Fill the cupcake liners about three quarters full. 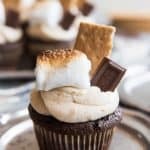 Bake for 15-17 minutes, or until the top springs back with a touch or a toothpick inserted in the center of a cupcake comes out clean with just a few crumbs. Cool completely before frosting. 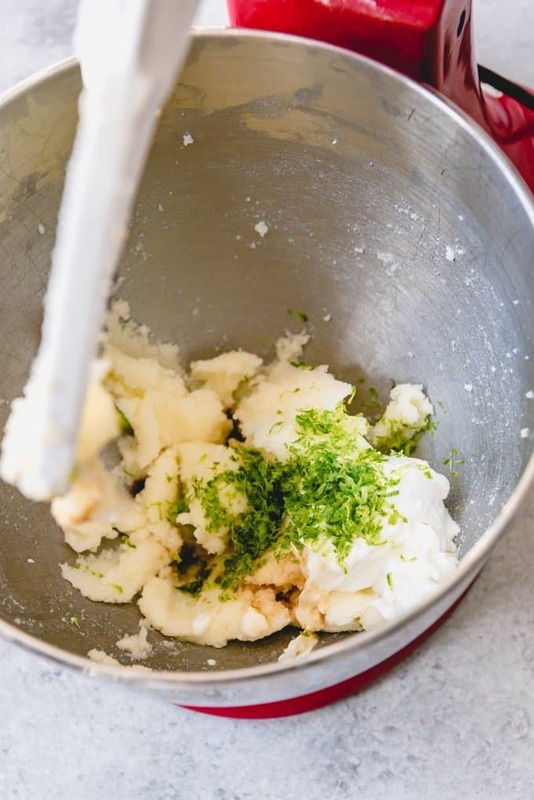 Beat the butter using a hand mixer or stand mixer until smooth. Add the powdered sugar in two batches, mixing on low speed until combined. Add the key lime zest and 3 tablespoons of the key lime juice, mixing until combined. Add more key lime juice as needed to reach desired consistency. Transfer the frosting to a piping bag fitted with a decorative tip. 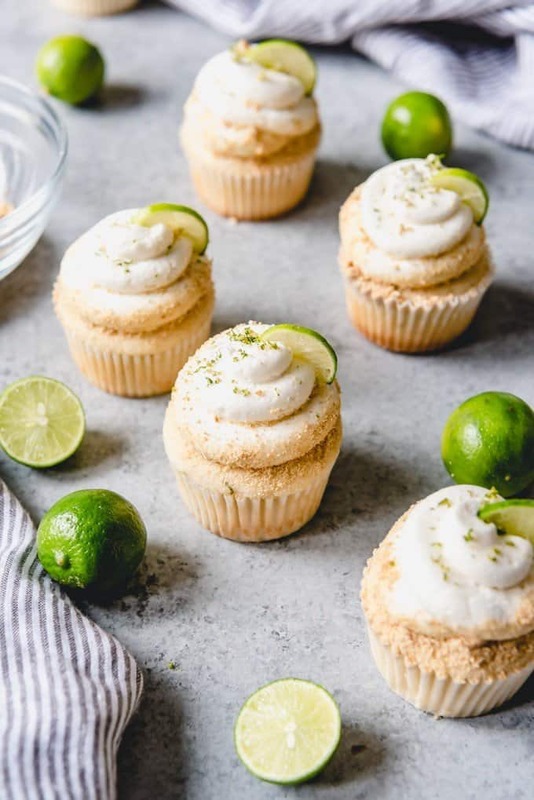 Pipe the frosting onto the cupcakes, then press graham cracker crumbs around each cupcake and sprinkle with additional key lime zest, if desired, and stick a thin slice of key lime on top for decoration. I’ve not tried it yet, but will this weekend. These cupcakes look so tasty. thanks for the recipe.